Says the island man, Gordon Nurse, in his delectable accent over a pan of peppery jerk chicken, "Thursday! August 28th. Caribbean! Food @ 8.pm. Music @ 9. Pm. Bears! 1401.. Fairfield . Live & Direct! Island ! Flavored! Music. Gordon. Nurse & 318. Riddim! Band.Reggae on Down Now." Listeners who have not caught the rambling, charming singer-songwriter Kyle Craft will be edified by catching him a Rhino Coffee's Anniversary party on Sat, Aug 23. Be aware that proprietor Andrew Crawford and the Rhino team, including Landon Miller, are working hard to make Rhino a worthy all ages venue. Hosting this scrumptious event at Agora Borealis are proprietor Katy Larsen, her mother, Peggy Gilloon, and Katy's majordomo, Brandi Cade. 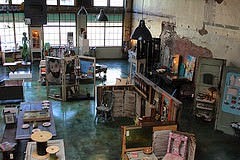 They have amassed work from some 60 artists in this region and have created a riot of color and texture in their historic building at 421 Lake St.
" Enjoy some Free freshly homemade Ice Cream by Chrissy Wise, local honey, granola by Aiden's Place Granola, fruit from local farmers & handmade sprinkles by yours truly," says Larsen. Be aware of the handsome parking lot behind the shop. A changing Shreveport: leisurely group bike ride from Columbia Park to Twisted Root Burgers on Fri, Aug 15, 7 pm. Wanting to try biking on the streets of Shreveport but looking for an easy way to get started? If so, consider joining a leisurely street ride on the route above, through tree-lined and bike-friendly East Shreveport. It's one of a series of rides being initiated by the SBC Bike Social, a like-minded if diverse group who communicate via the SBC Bike Social page on Facebook. It's the same group that does the end-of-the-month mass ride called Critical Manners, which has been organized by Stephen Pederson and Regan Horne. Darras Lattier has stepped forward to plan this Fri, Aug 15, ride. The group meets at Columbia Park between 6:30 and 7 pm. The ride, according to Google maps, is about 30 mins, about 5.4 miles. Says Lattier, "Come ride with us through the beautiful landscapes of the Highland and Spring Lake neighborhoods on a road which ends at Twisted Root Burger Co! Group biking is fun (and we'd like to say exercise too), but remember to Stay Hydrated (with beer). Ride how you like whether it's "your 1st time" or if you're a seasoned vet. This is a ride that's slow, fast, safe, craazy, cruising or just come newb it out and be social-like. Oh, and 1 more thing...biking is totally so much fun when there's Free Beer. That's right, a #shrimpdog over at Twisted Root is sharing the love of his wide selection of brews for cyclists who ride with the group." One more thing: "Have lights? You should. Don't have lights? Stay close to someone who does." Or have someone with a capacious vehicle pick you up when you're done. "Sometimes I hate talking about my art," says Emily S. Daye. "After all, I made it for you! I made it for me too. Or rather I made it to tell you something and see if you felt that way too, maybe." UnScene attendees have seen 2 of Daye's most impressive pieces in the sunshine of 2014. At the spring Makers Fair UnScene she was one of 3 artists given a steel shipping container in which they could do anything they wanted. Daye created a cloud-filled room filled with small student desks. Each desk offered pencils, paper and crayons for people who wanted to be students in a dream. It was called "Dream Dept." "Dream Dept." was based on a dream I had about Boo Radley from To Kill A Mockingbird working in a law office," she said. "I think I had this dream because I am a weirdo who works in a law office. All the desks were filled with odds and ends and doo-dads, just like Boo left in the tree for the kids." At the Wayne White Puppet Parade UnScene she installed a bevy of white-hulled boats on the concrete beside Texas Ave. People rowing the boats had a large fabric heart hung from their neck. It was called "Racing hearts" and was a singularly mystifying sight. "The vision for "Racing Hearts" came to me when my boyfriend asked me a simple question: "what makes your heart race?". I have always loved the water and boats, so giant hearts racing in rowboats naturally occurred to me." She observed, "I continue to love drawing, painting and sculpting, but I find the installation method is more enveloping of the viewer. I am really grateful I got this chance through UnScene." Of her "Racing hearts," writer Michael Sledge commented, "It was a novel and imaginative piece of street art. Looking at it satirically one could say it's a great example of many endeavors with a lot of action with no progress. And, thus, it serves its purpose because art is not measured by going somewhere or doing something but by its mere existence as a feeling and image evoking construction. I can look at this and think of a title "Exercise in Futility" and it reminds me, when I think satirically, of Dali's "The Persistence of Memory." Daye, who participated on a team in the recent art competition called UnScene! Undisputed!, added that, "I feel all kinds of things at different times, but I think my favourite feeling to get across to anyone is the feeling of whimsy. Whimsy is everywhere, if we only see with the right eyes. Recognizing whimsy can make you feel that anything is possible and I like this, because it truly is." Who likes her work? She said, "I think it was Picasso who once said, "All children are artists". If that's true, then I think I am in great company. I never make my art with children in mind, but they all really seem to like it-especially with the two last installations. The kids loved going through the desks in "Dream Dept." and making their own little creations. Kids swarmed the boats of "Racing Hearts" after the performance was done, and played make-believe games until it got dark. Let me stress again, I made this art for you, whether you are a kid, just young at heart, or even if you are very grumpy. I hope you feel something when you see my art, otherwise I have failed. I hope that something that you feel lets you know that the world can still be a pretty cool place." Daye has been named one of the installation artists for the Dr. Blood's Library Macabre event at Artspace Shreveport on Sept 12. Her piece will be based on Poe's "The Mask of the Red Death." "I learned if the vision is strong enough then the "hard" work-the heavy lifting, the bruises, the sleep loss, is all a breeze. Hard work becomes a joy and whether anyone likes it or not, I have said what i wanted to say and no, no they can't take that away from me, lalala." A Better Shreveport's meeting on Monday night, Aug 9, 6-7 pm, will hear from some bike path building heavy weights via Skype, says Loren Demerath. "To plot strategy for making Shreveport more bike-able and walk-able, we'll be hearing good news about a bike path network in our future, fresh from a meeting with Parish and MPC leaders. We'll be at the Wright Math Building on Centenary's campus, 2907 Woodlawn Ave."
Elaborate puppet show staged in gritty garage draws crowds for melancholy tale: Milissa Orzolek's "What keeps us"
Milissa Orzolek presented artful and melancholy puppet performances in a garage in the King's Hwy rust belt on Fri, Aug 8. A puppeteer who has worked with Arthur Mintz and Theresa Andersson on a movie and who toiled with Wayne White on the UnScene parade puppets, she and her cohort of 10 - Abandoned Ships - drew considerable crowds to her 2 shows. It was an elaborate entertainment. Opening with paper and pencil and cardboard lap boards, the audience drew a map of their abodes and routes to their favorite places. Then the story of a mysterious witch was revealed via numerous handmade sets and smartly varied lighting schemes. Among the most charming were graceful silhouettes. There was a clever attempt by the puppet townspeople to find the enigmatic figure by making giant broomsticks using utility poles. One of its strengths was the melodic and witty score performed and written by guitarist Kern Courtney and percussionist Peter Fetterman. Steady changes of lighting and of sets mesmerized the audience. Interestingly, the relatively small puppets telling the story alongside funky vehicles such as a bicycle and garbage truck were overshadowed by their human handlers. Orzolek eschewed the traditional mode of handlers being hidden from the audience by fabric or board. Instead, the humans were continuously onstage while they manipulated the figures. In presenting the show at a heretofore obscure location - behind Jim Hayes' LA House of Props on Kings Hwy - Orzolek stunned local art followers. Using cheap materials, low-tech methods and a pensive, enigmatic tale, she offered a persuasive, alternative mode for artful storytelling. Her production was not supported by grants, she said. Pennsylvania-native Orzolek, who has been living in New Orleans for several years, said, "I've been creating shows for a few years now. Long before I started living here." Yet her performance art arrives as Shreveport Regional Arts Council's UnScene series meets the one-year mark. Has the spark of energy from the Shreveport Common shows played a role in lighting fires such as "What keeps us?" Tori Bush, indie arts writer from New Orleans, joins a national panel of critics at Artspace on Fri, Aug 8, 9:30 am, for conversations on how to get art news more thoroughly into the airways. It's the aim of Shreveport Regional Arts Council's Pam Atchison to let artists and the community see where arts coverage is - across the country - and where it might go. The conference is called Conversations on Criticism. Having participated in the Thurs sessions I can vouch for the articulacy and thoughtfulness of the panelists. From Seattle is NEA rep Michael Killoren, from Los Angeles, book critic David Ulin, from Dallas, arts writer Michael Granberry (he broke the story on the massive sun reflection beamed by the 42-story Museum Tower into the Nasher Sculpture garden) and San Diego author and dance critic Anne Marie Welsh. The panel is led by San Diego art crtitic Bob Pincus. They will be joined by Shreveport Times editor Alan English. Atchison's target audience is art makers. Her goal is to help artists see how to use the media to best advantage. Sessions begin at 9:30 am. The cost was $40 on the first day, which includes snacks and lunch. Half price on the last day? Not sure. But if you're an impecunious artist, ask for a scholarship. Conversations on Criticism at Artspace Shreveport. Shreveport Common puts it out there on Thurs night, Aug 7, to show what recent artists have wrought, says Pam Atchison. 5:30, check a tour of the freshly hot Municipal Auditorium (Ray Lamontagne performing Oct 26; opening is Belle Brgade) featuring singer Brenda Wimberly performing in the balcony. 6 pm, a tour of the New Orleans Airlift Calanthean Canyon village featuring Pete Fetterman. 6:30, a performance on Steve Olson's Skateable Sculpture by Luther Cox Jr. and Inter City Row Modern Dance Company. 7:10 the trio Twang Darkly performs their new album, Martian Archeology, at Central ArtStation. Food trucks, appetizers, wine and beer. One of the pleasures of living in a city that is smart enough and large enough to have an opera company is singing in the chorus. Shreveport Opera will be holding auditions for the Shreveport Opera Adult Chorus on Sat, Aug 23, 10 am to 1 pm at the Anderson Choral Building, Hurley School of Music, at Centenary College, says Amanda Gouthiere. The 2014-2015 productions include Verdi’s La Traviata on November 15, 2014, Gilbert & Sullivan’s The Pirates of Penzance on February 21, 2015 and Rossini’s Cenerentola (Cinderella) on April 11, 2015. Please be prepared to sing one song that best shows your ability. Italian is preferred but not necessary. Please bring sheet music for the pianist. Opera Chorus rehearsals are Tuesday nights from 6:30 to 9:00 p.m. and Saturdays from 9:30 a.m.-12 p.m. 6 to 8 weeks prior to staging rehearsals. Staging rehearsals are typically Monday through Friday 7-10 p.m. and Saturday afternoons for the 3 weeks preceding each show. There is a $100 honorarium. To schedule an audition or for additional information, please contact Cathey Sholar at (318) 227-9503 or via email at cathey@shreveportopera.org. Advance Louisiana Film Prize tickets are available now and are $30 at lafilmprize.com/tickets/. The big weekend, Oct 9 - 12, promises to be galactic, says Gregory Kallenberg. The LFP comprises four screening venues, 20 films culled from a plethora of hard-working short productions and the ticket holders as voters. Top twenty announcement, Aug 20. Downtown types: 1980's parking meter heads, meter housings with no internal meter ‘guts’ and just guts (aka: innards) are for sale by the DDA, says Liz Swaine. "Meters come in various styles in various degrees of funkiness- selection will be first come, first choice; no pushing, please," says the droll Swaine. Intact meters $45 each, housings $10 each, guts $10 each; you can buy as many as you want. "The meters do not come with opening keys, as we are not total fools." Purchase in person for a limited time beginning Mon, Aug 4. See the meters and choose one Mon - Fri 8:30 am- 5:00 pm at 401 Edwards (Louisiana Tower), Suite 205, until all the units are gone or interest has run dry. Cash or credit card only. Super Water Sympathy will be playing their new set of songs set for a 2015 release, says Ansley Hughes. A new set design will be employed as well. Lights, Triangles, Paint, and the Unknown V Factor will be deployed. Opening will be Lish Starshine & The Spirit Animals. They have a tendency to eliminate the crowd with surprise, notes Clyde Hargrove, who adds, "Remember, we will provide paint but it's always enjoyed when you bring your own paint as well." Strange Brew, 235 Wall Street, Shreveport. 318-222-2337. New Orleans based artist Melissa Orzolek, aka Abandoned Ships, presents a puppet entertainment at LA House of Props on Fri, Aug 8. Shows are at 8 pm and 10 pm. She toiled with cardboard, glue and paint with SRAC guest artist Wayne White, notes Kathryn Usher, and is part of the Arthur Mintz (Fantastic Mr Fox in Shreveport and New Orleans) film crew. It is entitled What Keeps Us and is an "exploration of the neighborhood," which you can see her in rudimentary map. The performance site is a warehouse behind 2134 Kings Hwy. Students, teachers, businessmen, scientists and spies: all should be aware of the importance of the symposium being presented by Shreveport Regional Arts Council on Aug 6 - 9. It is "Conversations On Criticism: the future of intelligent writing on the arts." For a moment, drop the word "arts." Is this not a symposium applicable to all who care about criticism, dialogue and intelligent writing? Is critical writing a concern of a micronority? In terms of democracy and development of a society of broad competence, criticism and arts writing is not a trivial concern. It is not solely for the arts-minded. These discussions are the local equivalent of TED Talks or Aspen Society seminars. Need I press my case at greater length? The Renzi Education and Art Center is accepting new K-12 students for the Fall I Session of its free, high-quality, academic and art After School Program, says Jennifer Hill. It will begin Tues, Sept 2, and go until Oct 16, 2014. Space is limited, enrollment is on a first-come basis. Renzi Center, located in the heart of Highland, offers classes Mon through Thurs in a safe, nurturing environment. Families can sign their children up for all four days or fewer, depending on their needs. Each afternoon, from 3:45 to 5:30PM, students take two 25-minute academic classes and one 50-minute art class. Students typically begin arriving at Renzi at 3 pm. They receive a free snack and either play outside in Renzi’s fenced-in, supervised front yard or do homework until classes begin. When classes end at 5:30PM, parents must pick up their children. Unfortunately, the Renzi Center cannot provide transportation. Academic classes are held in Renzi’s Academic House, where students receive lessons and one-on-one tutoring from certified teachers in core subjects, such as Language Arts and Math and other classes, such as Spanish, Nutrition, and Computer Lab. Students take their art class in Renzi’s Art House, learning techniques and creative processes from professional artists in a variety of artistic media, such as Wire Sculpture, Cartooning, Photography, Creative Writing, and Pottery. The Renzi Education and Art Center was founded by the Sisters of Our Lady of Sorrows of Shreveport in 1997 after they received a house in Highland as a donation. After seeing that many children in the area did not have a safe place to go to after school and often needed assistance with their homework, the Sisters and a local artist, Donna Service, created Renzi’s free After School Program. Since 1998, the Renzi Center has served hundreds of area youth, helping them excel in school and explore and discover their creative talents. The Renzi Center is a 501(c)3 non-profit organization and accepts youth from all backgrounds. More info: Christy at 318-222-1414, or visit www.renzicenter.org.